Traditionally, directors who take on one of Shakespeare's works for the big screen aim to leave a lasting mark with their approach, whether it's adhering to the complexities of the original text or pushing the boundaries with the setting, performances, or imagery. 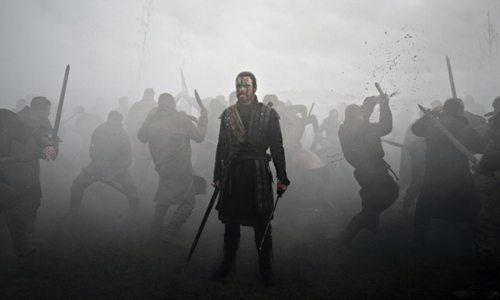 Justin Kurzel strives to do a bit of both in the latest adaptation of Macbeth, building atop the classical foundation of the bard's play with a gorgeous perspective on the landscape and predominately restrained delivery of the poetic dialogue. Driven by a slow-simmering performance from Michael Fassbender, this take on the maddened king revolves around the powerful drama present within the bard's tale of political scheming and prophecy across the moors of Scotland, concerned more with conveying a raw, instinctive mood than projecting the facets of the iconic play in a theatrical manner. Kurzel engages the senses and the deep emotions of Shakespeare's work in a bold and stirring manifestation, limited only by that cautiousness in subduing the literary tempo. Shortly after a stirring funeral sequence, the tragedy of Macbeth descends into its familiar melancholy demeanor with a fierce battle amid civil war, resulting in mass casualties that have a profound effect on the Scottish general of the play's title. As the dust settles, Macbeth (Fassbender) is approached by a small group of witches who proclaim him to be a Thane of Cowan and the future king of the land, suggesting a prophecy of his climb up the political ladder. Shortly thereafter, he learns of circumstances that have, in fact, placed him into the position of a thane, sparking thoughts about whether the rest of the prophecy -- whether he's destined to be king -- will also come to fruition. Propelled by his wife, the Lady Macbeth (Marion Cotillard), to continue pursuing the opportunity afforded to him, Macbeth surrenders to his greed and carves his own path to the place of a king, leaving one to ponder the veracity of the witches' declaration and whether the mad king actually engaged in a self-fulfilling prophecy ... and how long his reign will last. If pure imagery was all that mattered in a Shakespearean cinematic adaptation, then this Macbeth would likely dethrone most that came before it. Sparked to life with a beautiful funeral pyre and carried over into a blend of slow-motion photography and chaotic editing upon the battlefield, Kurzel's visual panache hits upon a violent, grimy viewpoint that bolsters the mythical atmosphere surrounding the tragic play. Sprawling shots of the misty, mountainous landscape highlight the desolation of the Scottish moors, not unlike the ways that Roman Polanski's version of the story did so, further accentuated by the unsettling bagpipe-infused music that grows with intensity alongside Macbeth's greed. The scenes are staged faultlessly, from the haunting presence of the witches to the despondent conversation between the Macbeths following their prophecy, using the eerie aesthetics to express the play's intended moods throughout: flickers of dark ambition, growing paranoia, and, of course, the claustrophobia of madness. But Shakespeare's all about the dialogue, both its boisterous presence within individual sequences and the gradual development of themes throughout, and this adaptation of Macbeth handles the poetic wordage almost like an mandatory obstacle instead of something to relish. Director Kurzel treats the language like traditional conversational speak with its volume range and enunciation, a creative choice that loses some potency through its low-key tempo and erratic accents. The craftsmanship is so polished and evocative, however, that the scenes themselves express their raw purposes and emotions without having to comprehend the bulk of what's actually being said, though the delightful bits of symbolism crafted by Shakespeare -- of guilt, of mortality, and of the color red itself -- are reduced to brief, sensory glimpses and muttered lines without enough impact to course deeper. These visuals speak louder than the bard's text, ending up as a double-edged testament to Kurzel's talent. Together with moody production design and costume work that cloaks the actors in the right temperaments, the performances in this Macbeth fully comprehend the path that Kurzel undertakes in getting the mad king and his bride to the throne, embracing their cunning and weather-beaten facets. Michael Fassbender brings a distinctively ominous presence to Macbeth, enriching the attitude of his conversations with his signature brand of intensity and fluctuating sanity. Instead of moving from stable to unstable, his Macbeth evolves from a manageable gloom to a thunderstorm of lunacy, elevated by the unique blend of suppressed pain and distress that the actor brought to his previous roles in Shame and Jane Eyre. 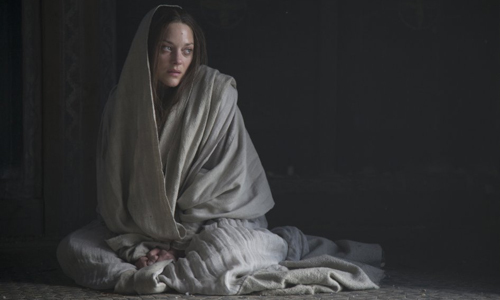 The wicked persuasion of Lady Macbeth takes on a unique presence within Marion Cotillard's wistful poise, shining a light on her shrewd manipulation as she tries to shape and bridle her off-the-rails husband. Their chemistry turns from impassioned to tumultuous with each evolution of their reign, a reflection of both the impact of their covetous pursuits and the lingering despair of their lives beforehand. That lack of theatricality influencing the earlier parts of Macbeth fades away in the later, more volatile acts of Kurzel's adaptation, a natural response to the amplified drama surrounding the backstabbing and psychosis in Shakespeare's play. Its tragic conflagration of witchcraft, rebellion, and comeuppance stokes the dialogue into becoming bolder and more fanatical, escalating alongside the gradually haunting depiction of Macbeth's deteriorating mental state -- and, by association, Fassbender's unyielding devotion to his descent. What ensues is a rather masterful sensory climax, reminiscent of the primal ferocity of Nicholas Winding Refn's Valhalla Rising and the spirited tonality of Braveheart, possessing the right kind of vigor and dramatic clarity that would've taken this into the upper echelon of big-screen Macbeth depictions had it been more prevalent earlier on. Kurzel manages to leave a mark with his rendition, but it's hard not to wish that the mark was more substantive than stylistic.